Both adult women and men and even adolescents desire a stretch mark removal solution because these marks can ruin the appearance of otherwise healthy looking skin. There are various options for stretch mark prevention and to reduce stretch marks. Not all solutions work for all individuals and therefore, a bit of experimentation is required. Healthy-skincare.com sells an ebook that discusses ways to get rid of stretch marks and ways to prevent the appearance of stretch marks in the first place. The book discusses various stretch mark causes. It also discusses prevention techniques. Vitamins, creams, and oils for preventing and reducing the appearance of stretch marks are briefly discussed. Exercises also play a role in reducing stretch marks and preventing them from appearing in the skin. The key exercises to focus on are summarized. More drastic options such as surgery and laser surgery are also stretch mark removal methods that are briefly discussed. Finally, a couple of all natural homemade recipes for stretch marks treatment are provided. Stretch marks removal is a difficult task to achieve. Only with proper information and trial and error can the right solution for stretch marks be found. Here is are some examples of what is offered by this stretch removal ebook. Drinking lots of water and fluids keeps not only your body healthy, but your skin too. Water keeps your skin firm and the collagen strong and healthy. When the collagen is strong, the skin will pull naturally and easily, with no stretch marks popping up. Steroids are described below should be avoided. Steroids have many dangers to a body. One of the ingredients in certain steroids actually reacts with the skin and can cause your body to form stretch marks. 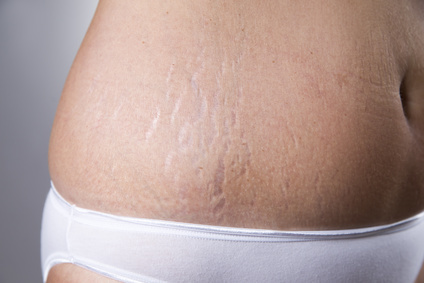 The stretch marks can occur anywhere – the legs, arms, abdomen and buttocks. Steroids given for treating medical conditions are not the suspects, but steroids used for body building and weightlifting are. These types of stretch marks mainly occur in men. With puberty, expect the changes in your body to be fairly drastic. Puberty is the result of many hormones changing and developing your body. Many of these hormones will affect the skin in the form of acne, growth spurts and stretch marks. To reduce the stretch marks, keep taking vitamins, drink water and exercise. Do not feed the hormonal urges with unhealthy food and eating which will only make the acne and skin problems worse. Following some steps to prevent stretch marks will eliminate the need for stretch mark removal.